“sigh” he sighed. It was a good sigh too. “It’s just that my bed is sooooo comfortable when I wake up but I know I have to get up at some point”. Xavier got interested in typing after realizing that the “big kids” take typing classes, and he should probably learn this skill too. So, I popped him in front of the laptop and opened a simple text editor, thinking he’d just bash away at the keys for a bit. Instead, he wrote a story. Here’s the complete, unedited version of X’s first typed work. wonce upon a time ther wus a boy named jon.jon had a cat named kiwi. kiwi and jon played in the sun on a nice day. but jon dinit realized that kiwi wus stolen. when jon noticed that kiwi wus gone ! jon searched in the house . then in the front yard . then he called 911 and the police . the police asked jon some qestcheins . and cote the robber . the end! 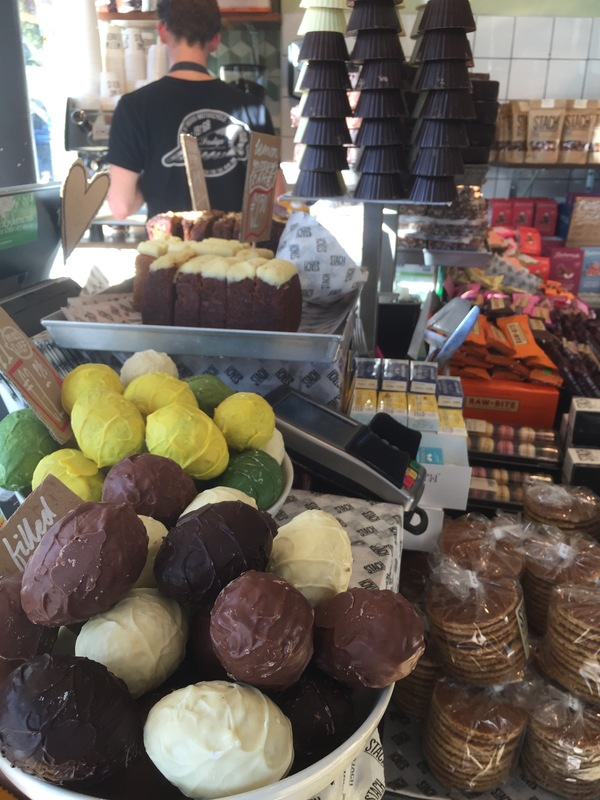 The last time I came to Amsterdam, we tried something Bitterballen. This local snack is made by first creating a roux, loading it up with little bits of chopped meat, somehow breaking into bite sized portions, and then deep drying the whole thing. We recognized it as deep fried gravy balls. 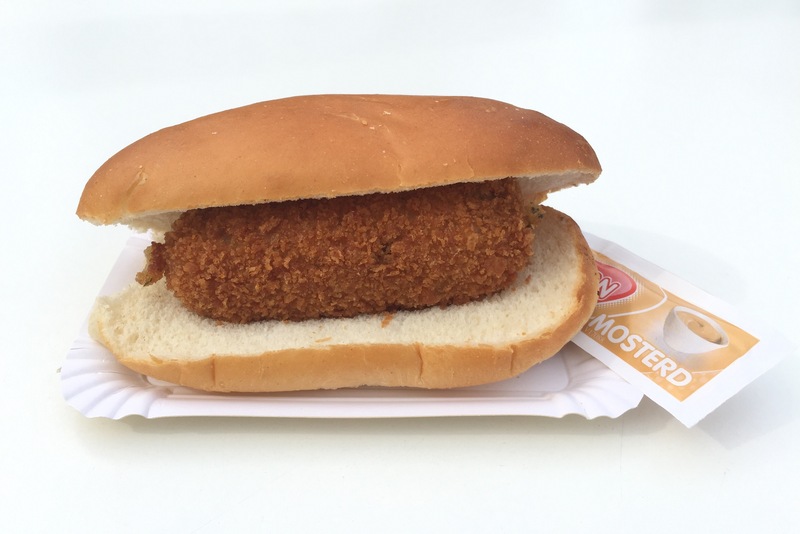 While I did grab a bite of bitterballen along my walks, I found it’s big brother: The Broodje Croket Sandwhich while tiptoeing through the tulip gardens at Keukenfeld farms. 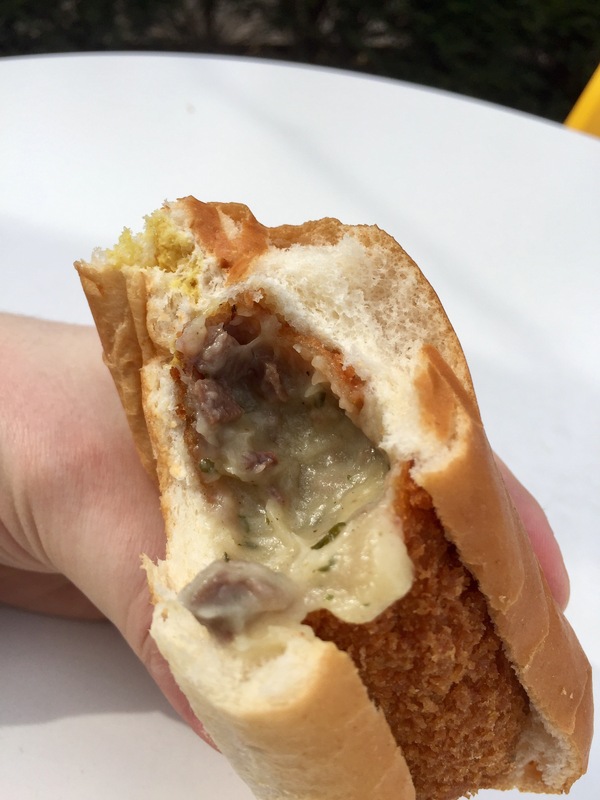 If Bitterballen is deep fried gravy balls, this was a deep fried gravy sausage, served with hot mustard on a brioche bun. The interior is really similar to what Americans call sausage gravy; that’s the chunky stuff they pour over biscuits. 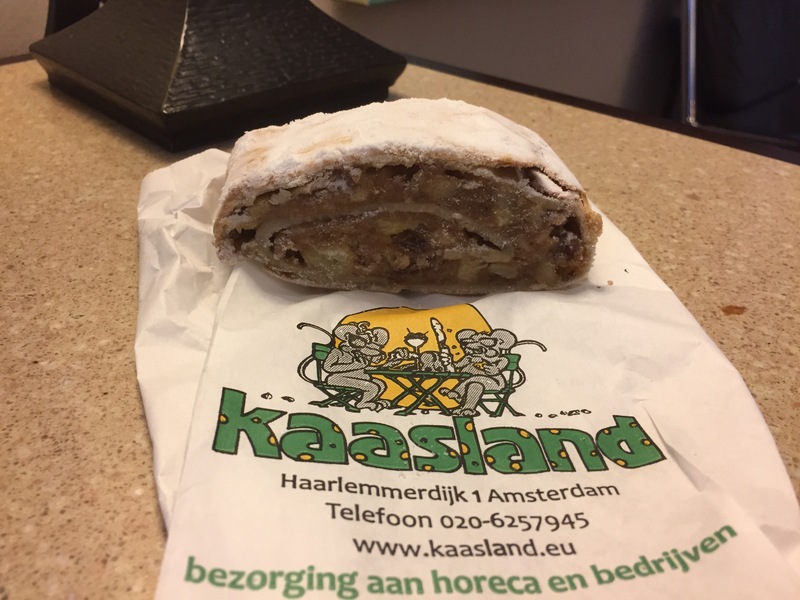 The main difference is that the Dutch version is influenced by their settlements in Indonesia and is lightly spiced with a bit of nutmeg, and some sweet soy sauce. 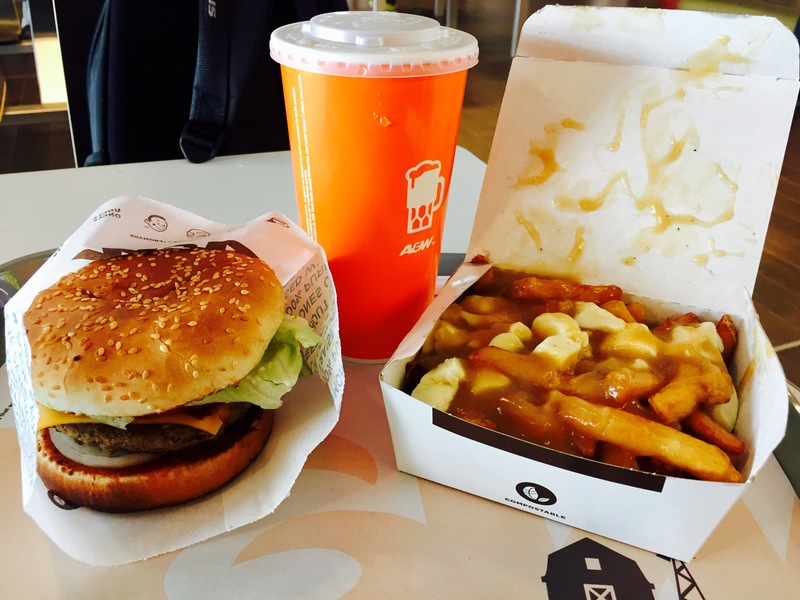 Not surprisingly, this was a pretty filling meal, and made up most of my afternoon nutrition. This and two more terrible coffees. I don’t know what coffee did to offend the Netherlands, but it’s obviously resulted in a deep and lasting feud. After my adventures in tulip land, I hopped back on the train and eventually followed the crowd out of the wrong doors at Amsterdam Centraal station. Instead of walking towards the city, I came out the backside, towards the wharf. No biggie, I used my famous sense of direction to get horribly, horribly lost amongst the walkways and waterways that make up Haarlem to the west of the city. 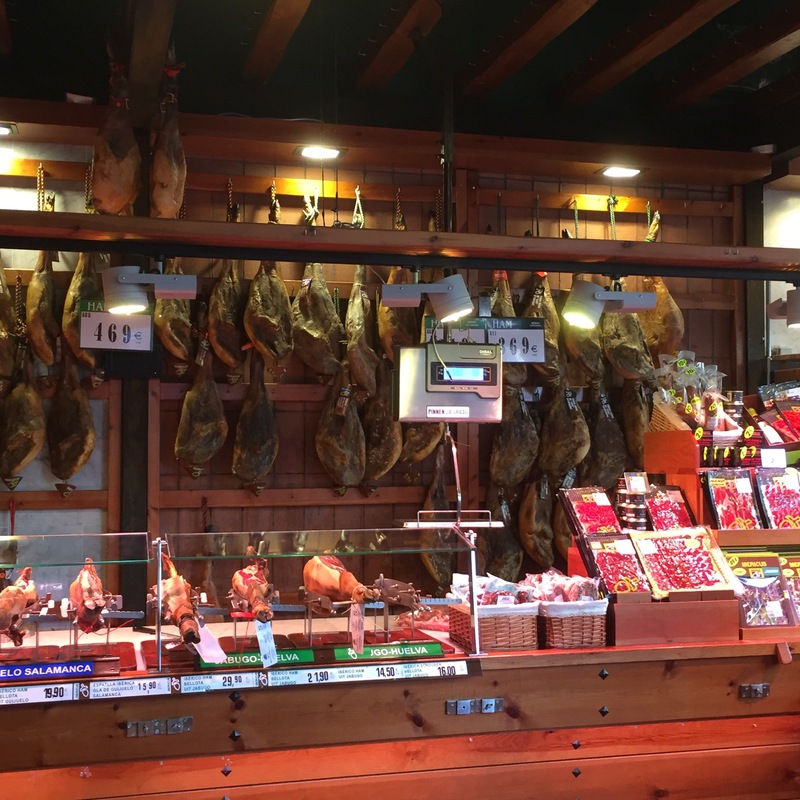 This neighborhood was much more mixed residential than I’d previously seen in the city, and it was a real joy to pop into bakeries, cafes, fromageries, and various other small food vendors. This sandwich is literally everything I miss about Europe. Sold by a ham specialist (pic below) it’s made fresh on premise with items from the neighborhood. 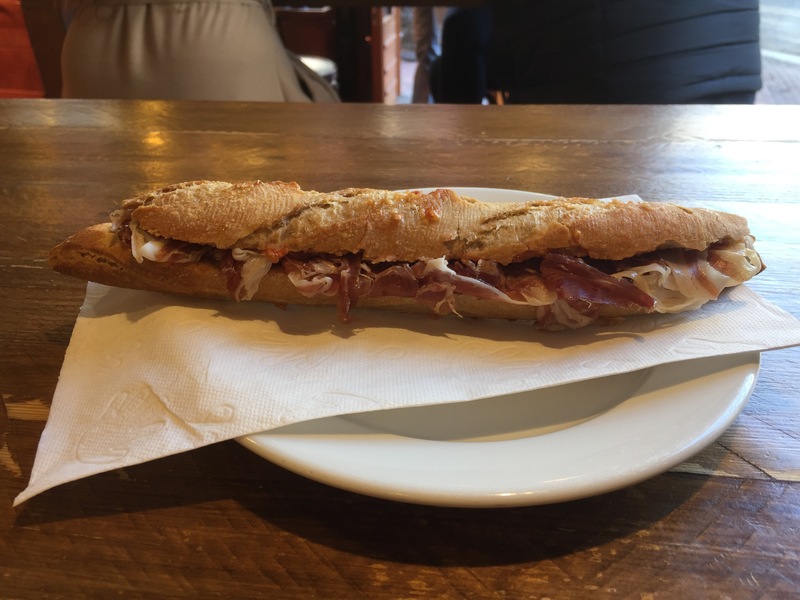 He buys fresh baguettes from a guy around the corner, cuts them in two, rubs tomato on one half, and olive oil on the other, and then carves a pile of iberico ham off a leg to go between. Lunch/dinner out of the way, I didn’t make it far out of Ibericus before I started eyeing up desserts in bakery windows. 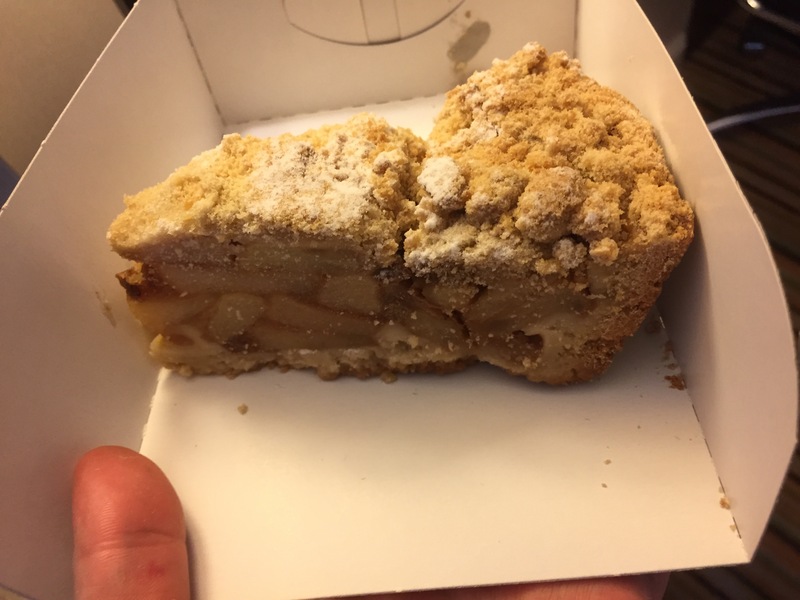 This streusel and its friend the apple pie both came back to my hotel room for a later snack. At this point, I was tired, but there was still a few hours of daylight, and I’d promised to bring home some gifts for the family. Gifts in this case amounted to cheese from Henri, who I gather is a big deal in the Dutch cheese making world. I gave holland one last chance at coffee on the way home with mixed results. 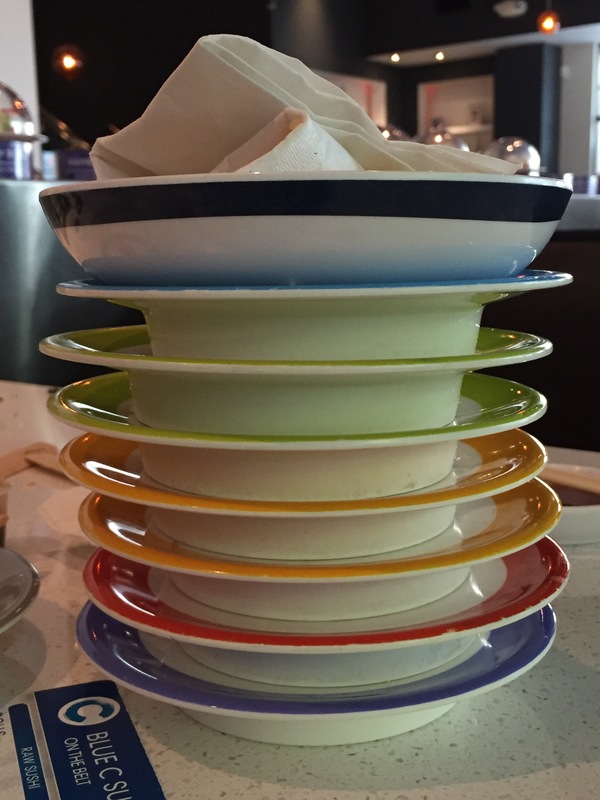 What I’d ordered – the Special – was a thing of beauty. 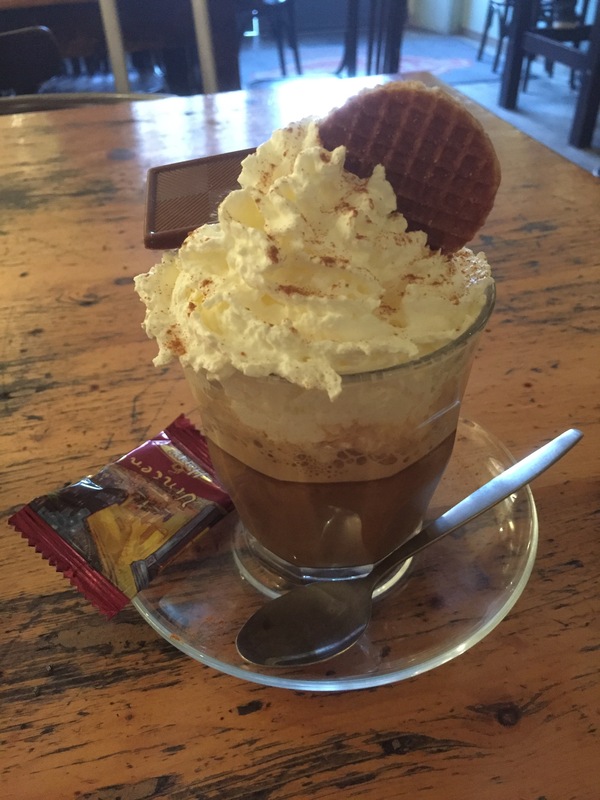 A moka with whipped cream, cookies, chocolate, and at least a little coffee. It wasn’t really “coffee” though. I give up. My coffee shop experience being a little less than I’d hoped, I decided to look for some late night munchies instead. 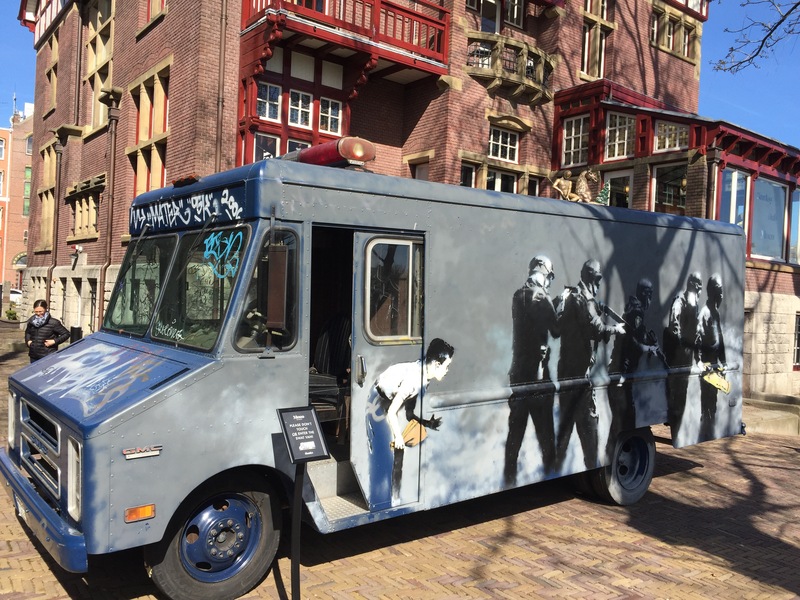 I didn’t have many things on my tourist todo list for Amsterdam, but seeing the Banksy exhibit was probably my first, second and third priority. 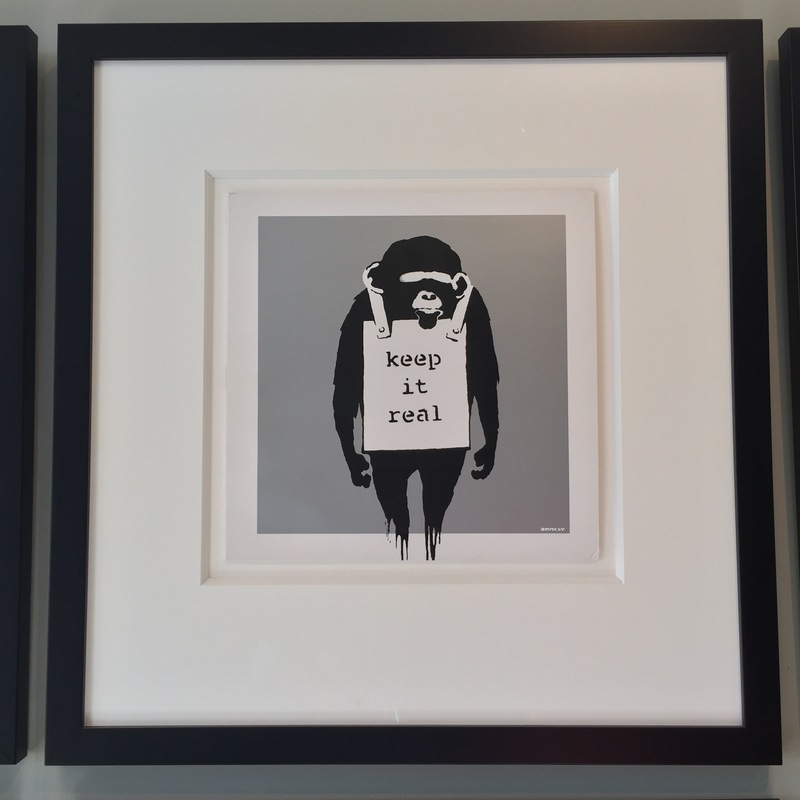 Banksy is a modern day artist who rose to fame for his politically charged street art. 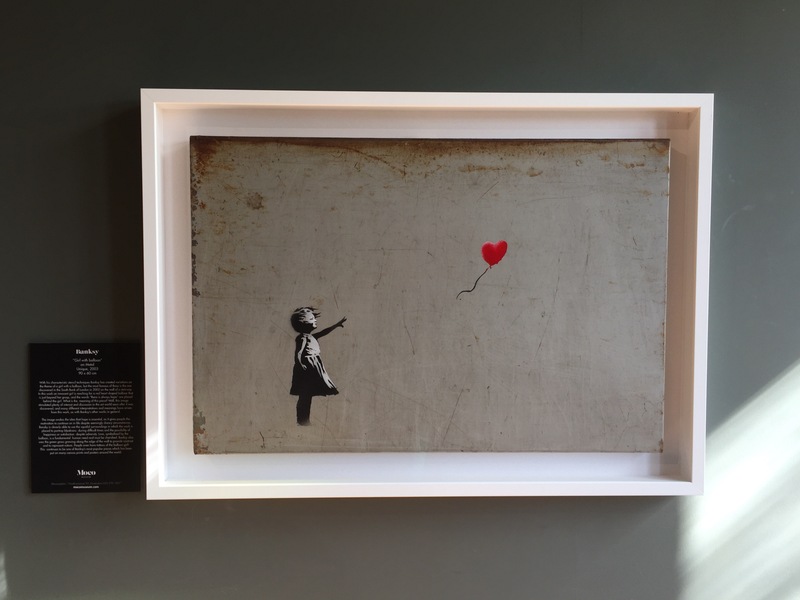 More than just the art, Banksy was notable for their anonymity and the incredible locations of the artwork, which appeared in banks, war zones and even an elephants cage at a city zoo. 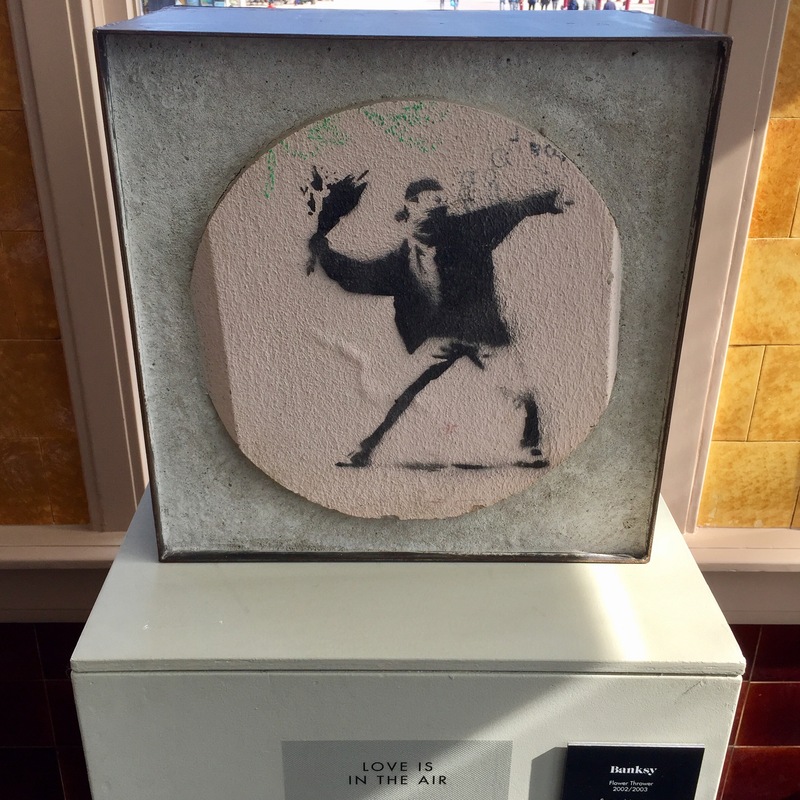 Between the desire to remain anonymous, and the difficulty associated with moving the “canvas”, there have been relatively few exhibitions for someone as famous as Banksy. 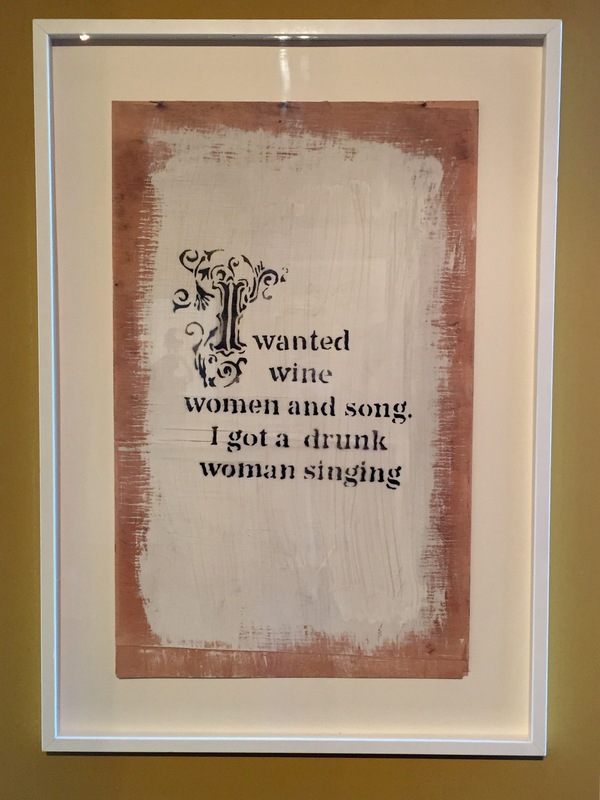 All the more reason I was excited to find that the Moco art museum in Amsterdam was playing host to an exhibit of collected works. The Moco is an old house – probably a mansion by Amsterdam standards – that was vacated in 1939 and later donated for public use. The exhibit made great use of the space, using the natural light from the windows to accent some of the pieces, and placing art in slightly out of the way spaces – above the door, or a hard to see wall – so you still had the feeling of having to look to find everything (and that, perhaps, you wandered right past a piece without seeing it). It was very light on explanation though, which is also fairly true to the artists work. Consequently, I now present a few pieces with minimal explanation as well. Enjoy! My flight made great time and we arrived half an hour early. With no bags and no sleep I was quick off the plane in hopes of getting in a quick nap before sightseeing. No luck though. After a short train ride to the city center I stopped in at the hotel and was told to come back at three. So, time for breakfast! Amsterdam is small, pretty and very walkable. I had a short list of places I wanted to visit today, and all were in the southern “Museumplein” district at the south end of the city. Departing the hotel I made a beeline for a canal and had a lovely (and very quiet) morning stroll to my first stop: the Albert Cuypstraat Saturday market. 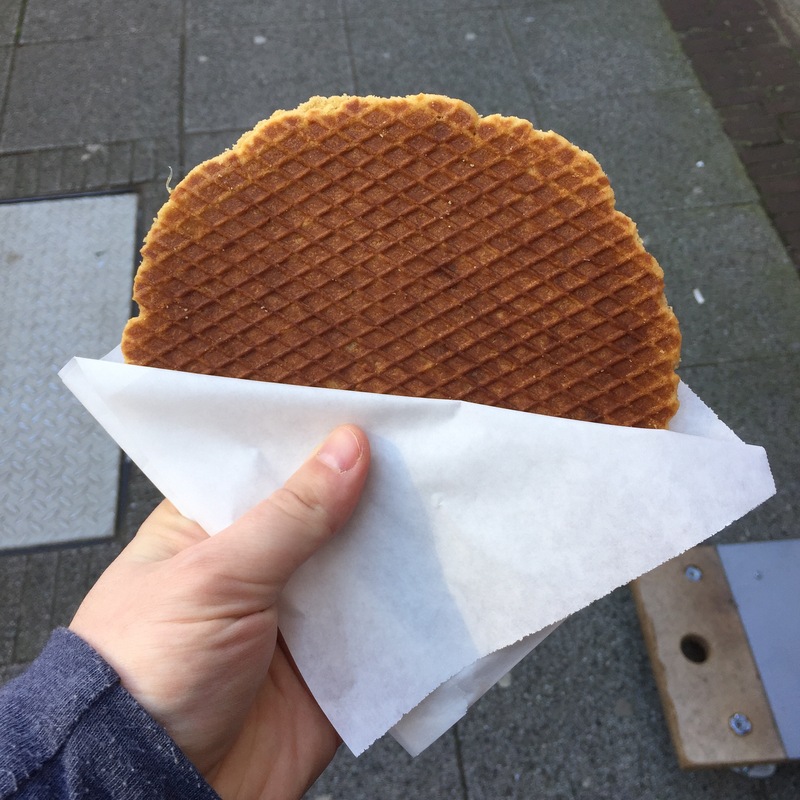 My first acquisition of the day was a giant Stroopwaffle – two thin waffles stuck together with syrup. This was a perfect snack to tide me over while I went searching for the real treasure, raw herring. The “raw” part of raw herring is a bit of a misnomer. After being plucked from the North Sea, the herring is flash frozen (to prevent parasites) and then gutted, deboned, skinned and laid on salt for a bit. So less raw than sushi but more raw than ceviche. 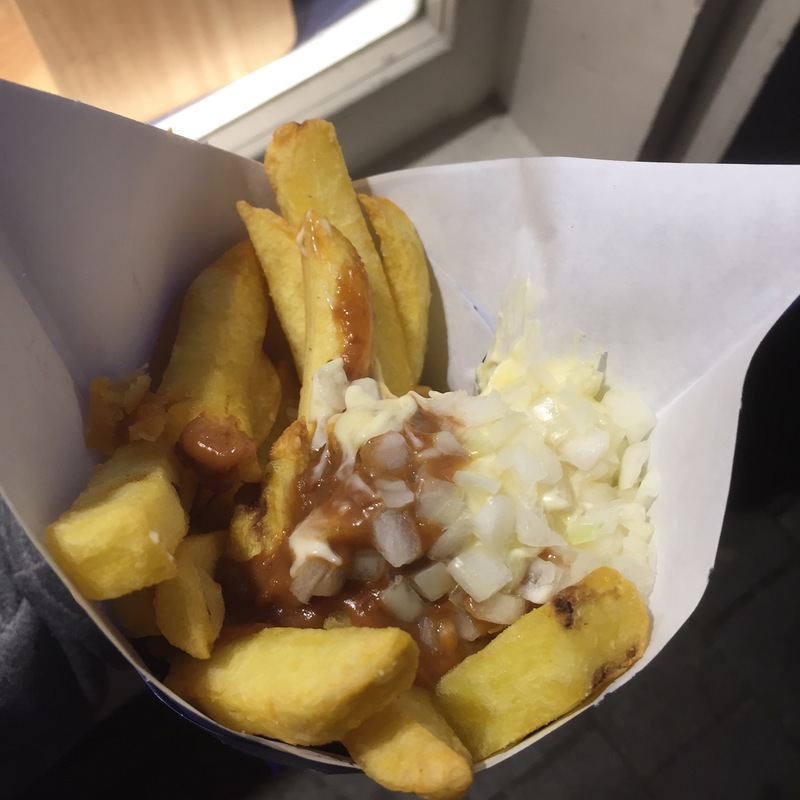 Traditionally it’s served with onions, sweet pickles and a tiny Dutch flag. I gather the idea is to use the toothpick to pick up the herring pieces, roll them in onion, and have a pickle chaser. I lucked out and stepped just outside of the market in search of coffee and found a small shop that seemed to be to fish what a deli is to pigs. I’ll make a note here so I can come back next time I’m in town. 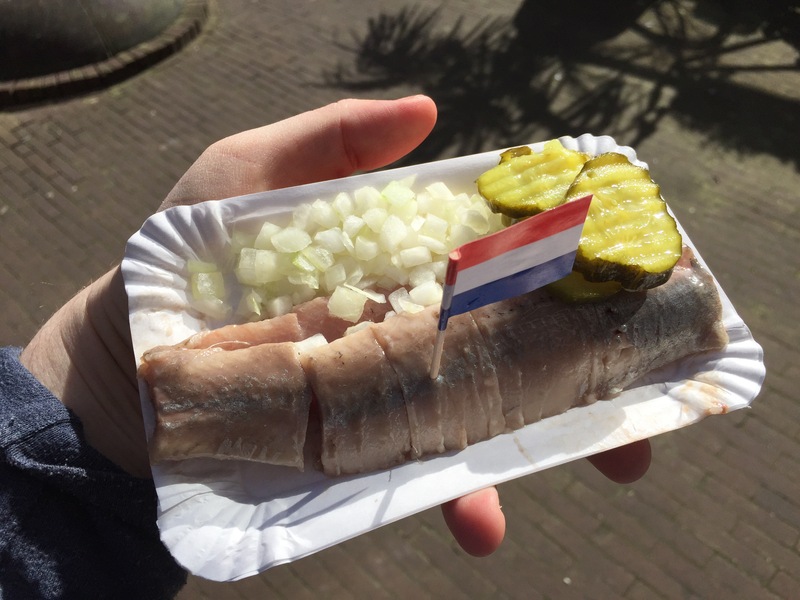 Mission accomplished, I left the market with a belly full of herring and wandered my way up and down the side streets of de pjip neighborhood until I found Museumplein. 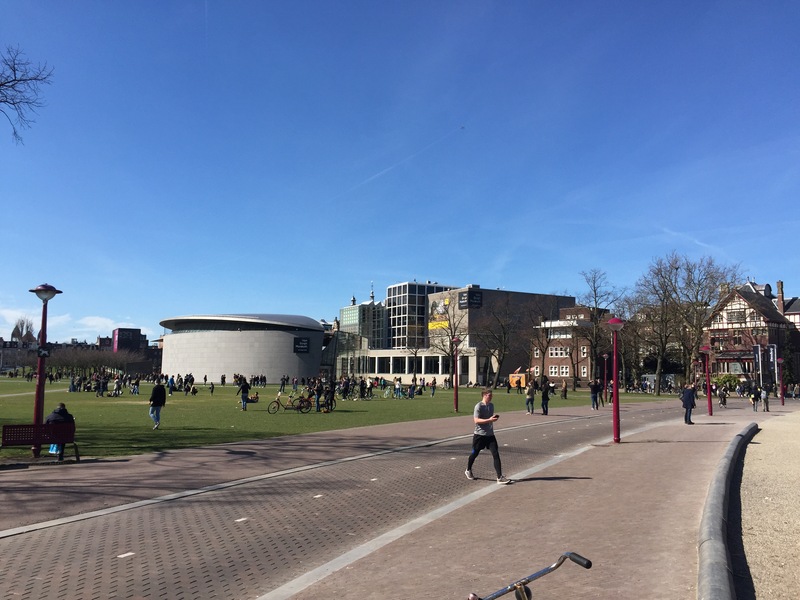 Museumplein is home to several of the city’s art museums. I’d been here on my last trip to see Van Gough and taste genevar at the House of Bols. 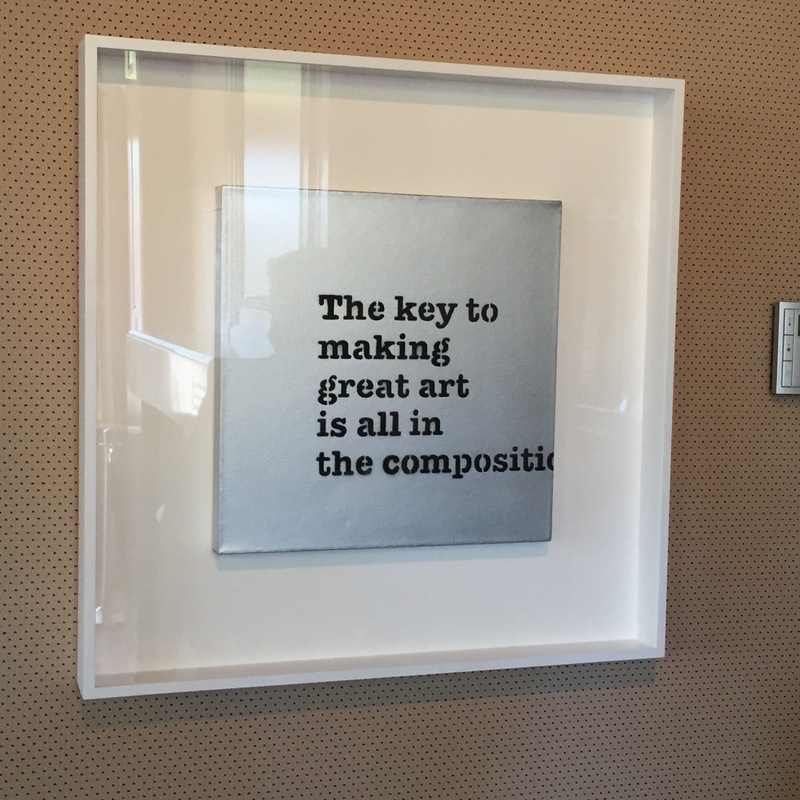 This time, I wanted to check out the Banksy exhibit at the Moco modern art museum. More on that later. Following the museum adventure I grabbed a crummy cup of coffee from a locale cafe and got horribly lost en route to my final destination, and only repeat visit, the Heineken Experience. 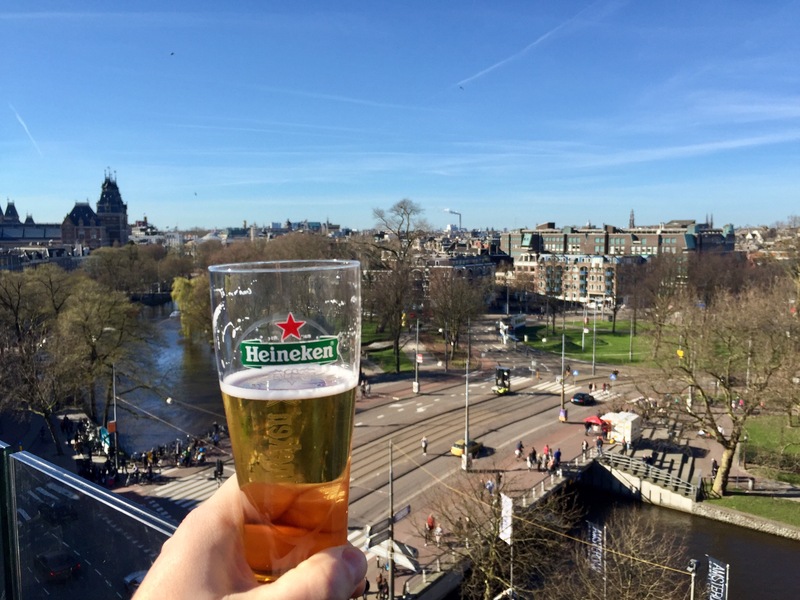 Heineken is a local brewery that grew up on the outskirts of Amsterdam. 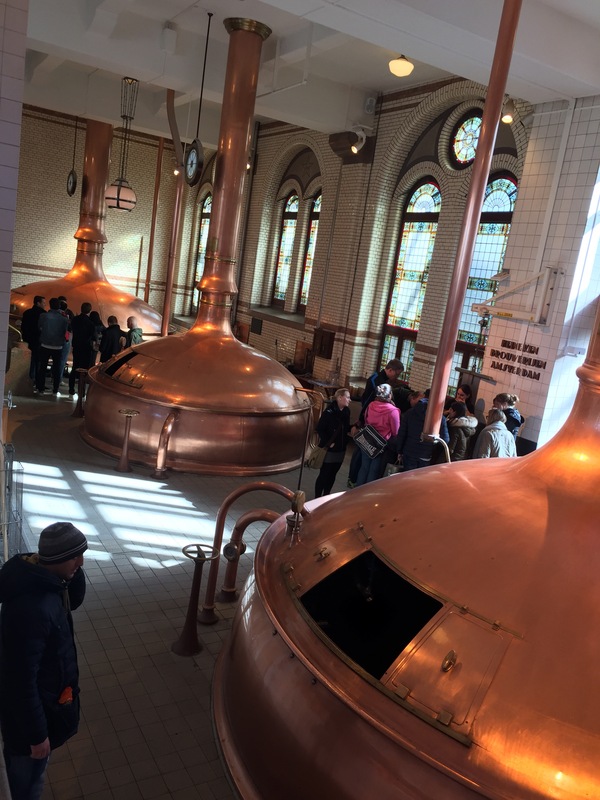 The museum has a typical brewery tour experience to it, but with a few extras that come with being a global brand. I appreciate the sections dedicated to post-prohibition growth, and the bits explaining that the founder was a chemical engineer and one of the pioneers of beer science. 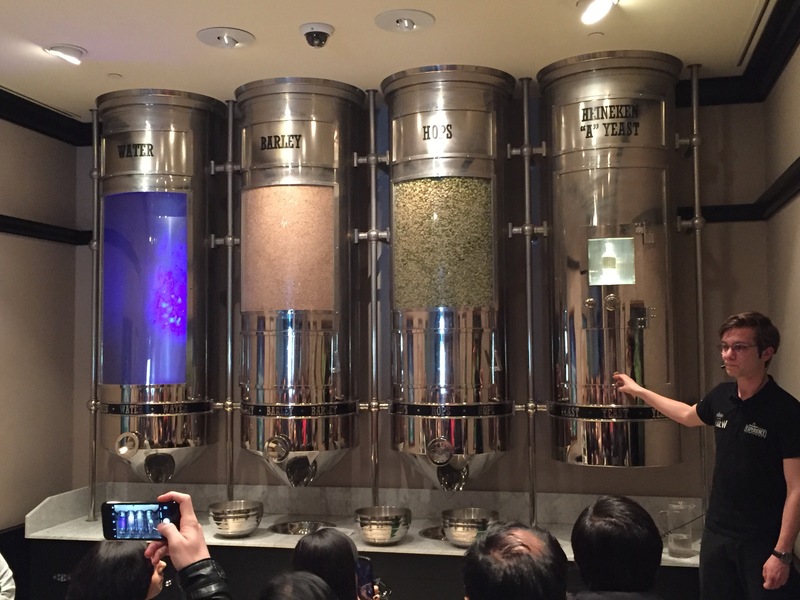 Previously, brewing was thought of as more similar to baking or cooking. The best part though is the view from the roof top bar at the end of the tour. After the tour I took the scenic route back home, passing locals relaxing in the sun all up and down the canals. I stopped in for a few snacks along the way, to keep my strength up. 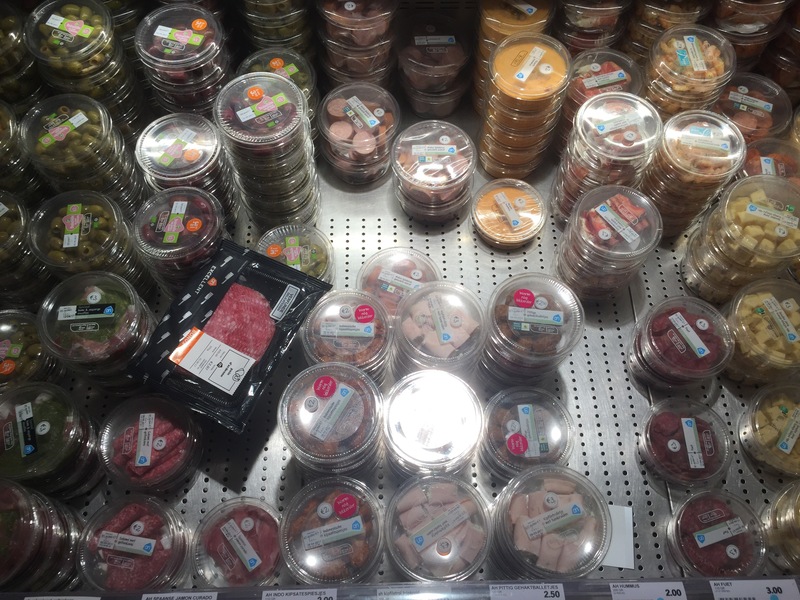 Amsterdam has no shortage of snacks, I suspect in part because of the local cannabis tourism. What came first, the munchies or the chorizo-manchego macarone? 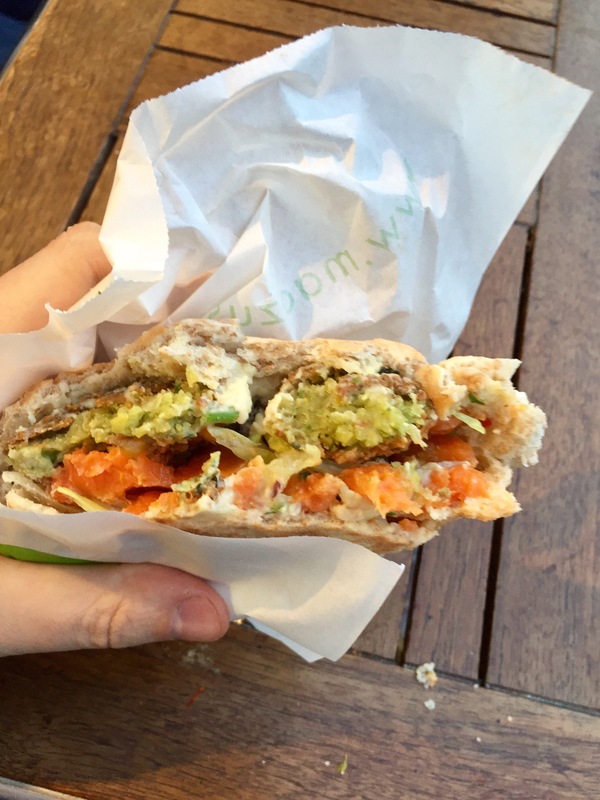 On the way home I passed a Maoz Vegetarian, a falafel stop that we used to frequent when we lived in Paris. I figured I could go for some falafel, and so that made dinner for me. 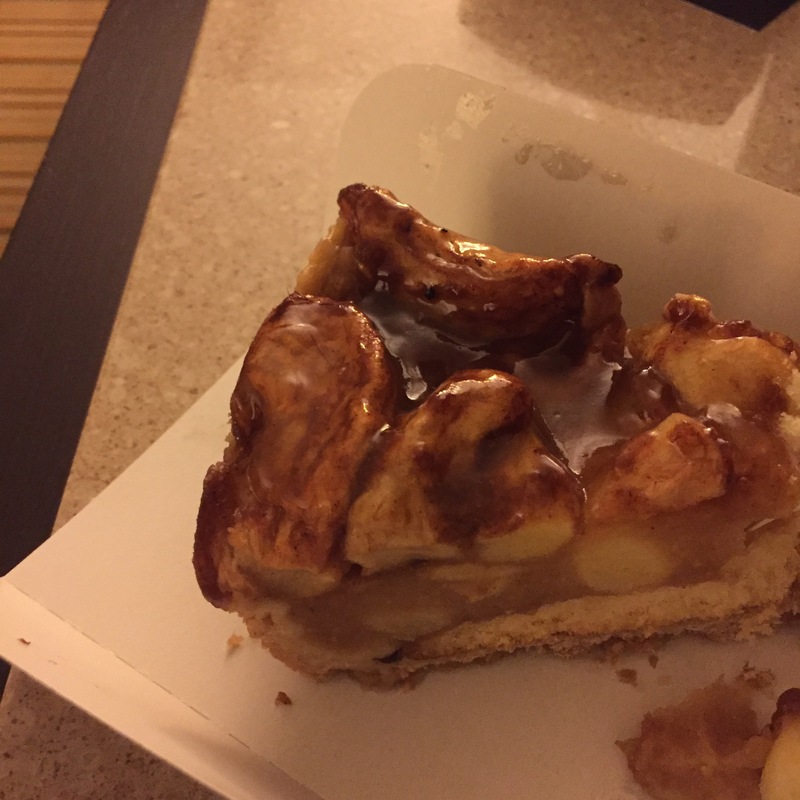 For dessert, Dutch apple pie. 🙂 followed by a very early bedtime and a glorious 11 hour slumber.